A new world record carp was caught on a French public water in the summer of 2010. Weighing 38,2 kg, the carp is said to be the new world record carp, and of course a new French record. Laurent Panelli caught the mirror carp nicknamed 'Neptune' on a unknown public water in southern France. The capture marks the biggest carp ever caught on a public domain in France or anywhere in the world and came as a surprise to the angling world, since Neptune was caught in the last five years. The last known capture of the giant mirror dated from 2005, when it was taken three times at 26 kg, 27 kg and 29,6 kg. Details about the record water aren't known, except for the fact that it's a public lake of about 50 ha. (124 acres) located in the French Gard department. 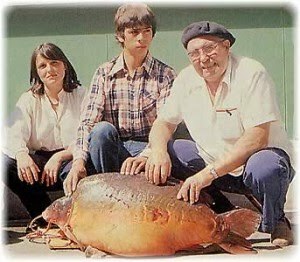 The interesting thing about this French carp record is that the previous record had lasted for decades. Back in 1981 French fisherman Marcel Rouvière captured a massive mirror of 37 kg on a the river Yonne. This record lasted until this year's catch of Neptune. Earlier in 2010 Rouvière's record was almost broken, when a huge mirror nicknamed 'Nautilus' was caught in South France at étangs Perrier. The weight of 36,5 kg (more than 80lb) was just short of breaking the French carp record. The current world record carp still is the 99lb The Scar from Les Graviers. The new world record taken from a public domain right now is Neptune.